Exclusive presentation and concert for InterNations, of the OLDEST organ in Vienna! After the fantastic activity we had in April Protected content photos you can see here were taken by me that day), we decided to make this activity again. It was so great, Mr. Ebenbauer will explain everything about the history of this JEWEL of instrument in Vienna, how does it work, he will open the organ for us, show us the different sounds and different pipes (90% are original! ), we will have the chance to see its back and the whole system! This is usually offered between April and October, but Mr. Ebenbauer, curator and organist of the church, has been so nice to make an exception for us doing this in the winter time and on Saturday! 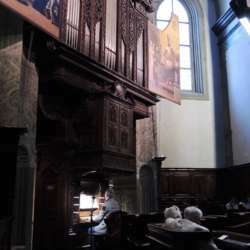 In the heart of Vienna, hidden in the »Betchor« of the Franciscan Church, you will find a special acoustic gem: the oldest organ in Vienna – the so-called »Wöckherl Organ« from Protected content !! !, named after its builder Hans Weckherl (alias Wöckherl). The »Betchor«, a special, hidden room, is not usually accessible to the public. Just as interesting as the early baroque organ is the »Betchor« room itself: its grisaille paintings, newly discovered and exposed during the course of the organ restoration, are also of the highest artistic and historical importance. PLEASE only sign up, if you are sure you can make it. I have a personal interest in helping to promote this magnificent instrument, which is a piece of art and I’d love to have the place full. I kindly ask you to PLEASE HELP ME bringing family and friends. In that case, please inform me with a message to have the track of how many people we will have. Contribution requested: €5 adults. Of course, if you want to donate a bit more, it will be very welcomed! Children: min. age 6 years. I will collect the money while people arrive and give it to Mr. Ebenbauer after the activity. If some have interest, we can go for lunch after.